WhatsApp Messenger - Be available, all the time! iPhone, Blackberry, Nokia, and Android couldn’t bee any different—and yet they all have something in common: WhatsApp Messenger! WhatsApp is a multi platform messenger which will help bring you and your (Smartphone) friends a little bit closer together thanks to its awesome features and truly unbeatable price. Read today’s review to find out if WhatsApp Messenger has what it takes to replace SMS/MMS for good. App details: As of: Android 2.1 / Required authorizations: quite a few of them, but they’re all necessary. WhatsApp Messenger lets you exchange texts, music, videos, locations, and contacts… and you aren’t bound exclusively to Android as there are clients for iPhone, Nokia, and Blackberry. If you're thinking “Big deal, Facebook, Gmail, and SMS can do that!” all I can say is: true that! Otherwise we wouldn’t be so attached to our beloved Smartphones. But WhatsApp Messenger provides a new service that other multi messengers such as Facebook currently aren’t offering. 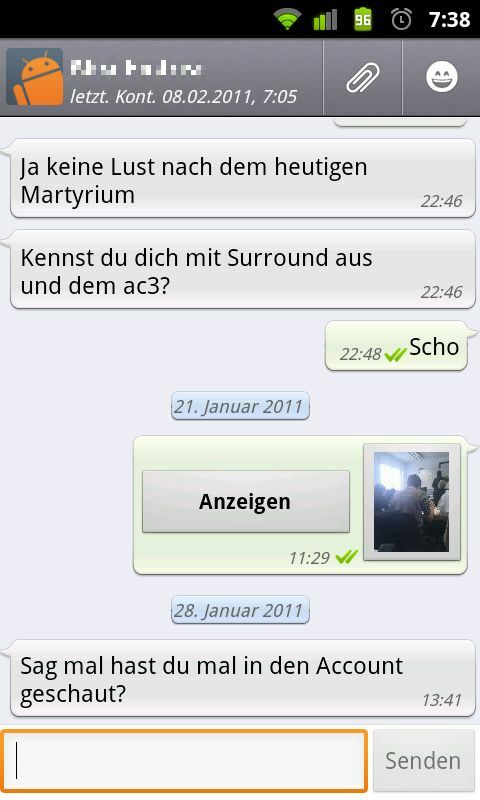 The good old SMS is a good example: you can receive a text message – connection permitting – anywhere and everywhere and without having to sign into Facebook Chat or ICQ. That’s what makes WhatsApp Messenger stand out. Without much further ado you can basically be online all the time, and all of your smartphone buddies can reach you. If you manage to convince a friend that WhatsApp Messenger is the way to go you may live to regret it – being permanently available has its down-sides, too – but you can’t argue that the system works flawlessly. Even the cheapest SMS flatrate can’t beat that! •	1 check: Message was successfully delivered via WhatsApp server. •	Clock: Message has not yet reached the WhatsApp Messenger server due to lagging internet connection, e.g. This is a really easy and convenient way of keeping on track of whether your messages have been sent off successfully. All of this is, of course, contigent on WhatsApp running in the background, but this shouldn’t use up too much of your battery life. ICQ and Messenger definitely use more battery than WhatsApp Messenger. For our root users: if you like to try out different ROMs you should think about backing WhatsApp up using TitaniumBackup or a similar app. This will prevent you from having to restart the process every time. The first time you use the app you will have to register using your cell phone number. You will then receive an SMS containing a code which allows you to activate your account. If there’s any trouble check the FAQs on the WhatsApp Messenger homepage. The app then searches through your contacts and notifies you which of your friends are already using WhatsApp Messenger. Every contact is also added to your address book. Once this is done you can pretty much get cracking. Start a new conversation using the pen. If you haven’t got any contacts go to “Menu” and “Update”. You can write your text into the chat pop up window, as well as use one of the many emoticons or else insert pictures, videos, audio, location, or contact by clicking on the paper clip icon. If ever you aren’t satisfied with your message you can delete it with a long click. Alternatively, you can forward it to your WhatsApp contacts or copy the content and paste it elsewhere. Within the chat window you can click on the Menu button and call or block a contact, delete all of your messages, or send the entire chat thread via email. I found the option the insert a link on your homepage really useful. “New” lets you create a new chart using the pen icon. “More” / “Several Recipients” lets you send to more than one recipient but won’t copy the conversation as a group chat (use the new Group Chat function for that). WhatsApp’s group chat is similar to the Skype for Android one: it lets you chat and exchange date with your contacts. Use the “Status” to let your contacts know what you’re up to (“Working”, Sleeping”…). Your friends’ statuses are only revealed when you beign a new chat. “Message settings” and “Group notifications” are probably the most interesting options here. Decide if you want to be notified with vibration, LED, or popup window when you get a new message. 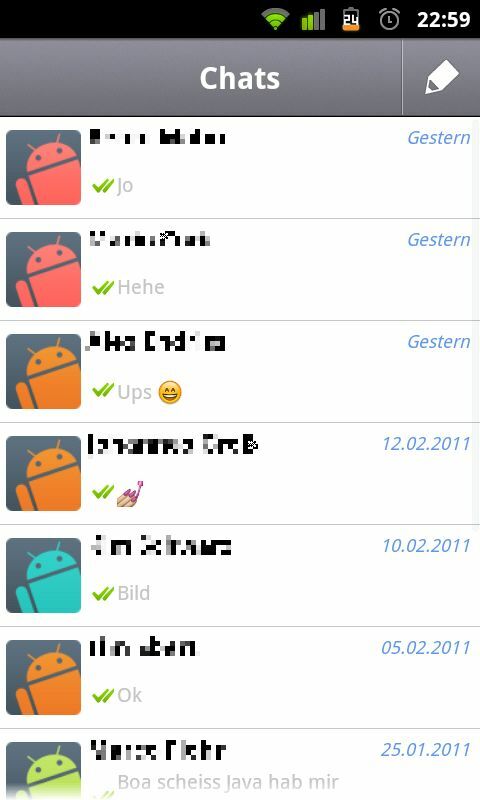 If every Smartphone came with WhatsApp I probable wouldn’t need SMS any longer. I’m really impressed that this app allows you to send a lot of information between different types of Smartphones. Having internet connection is a prerequisite, but I’m betting that nowadays most users will have a flat rate for their Smartphones. When I first started using WhatsApp I was annoyed that you can’t switch the app off unless you deactivate WLAN, but on the other hand that (amongst other things) is what makes this app stand out. I certainly don’t want to make do without this app any longer—any luckily neither do any of my friends! My friends and I tried out a bunch of configurations (Froyo Stock, CyanogenMod, Gingerbread Redux, Leedroid) and we didn’t encounter any difficulties. I’ve been using the WhatsApp Messenger for a few months now but can’t recall any crashes. The app’s speed is the bee’s knees! Starts up fast and runs very smoothly. WhatsApp Messenger can be downloaded free of charge from the Android Market. The app is free for a year; following that it will cost US$1,99 a year, which is a totally acceptable price. I don't quite understand, please explain. What's with the large install size? and why does it complain about the Advanced Task Killer I've got installed. Is that a problem? Hi!! I did receive the whatsApp code, it says safe to discard...not sure hot to proceed now.. plz help!! Thanks. has this review been written by the developers themselves?